COMM-TEC announces exclusive distribution partnership with DEXON, manufacturer for video wall controllers for multi-screen video wall projects. COMM-TEC enters into an exclusive distribution partnership for the regions of Germany, Austria, Switzerland and Spain following a successful cooperation on the Italian market. DEXON's products are used in the fields of displays and LED walls. Typical applications are control rooms, process monitoring, security areas, but also applications in large conference rooms. Carsten Steinecker, Managing Director Business Development at COMM-TEC, says: “The partnership with DEXON will bolster COMM-TEC`s “one stop buying” claim towards the System Integrators at the upper end. DEXON targets medium to large signal management installations with premium quality and highly scalable solutions. DEXON offers modular devices that can be equipped with appropriate input and output cards (HDMI, HDBaseT, DVI, 3G-SDI, analogue, audio) depending on the requirements. One of the big advantages of DEXON's solutions is that larger video walls can be realized because the number of inputs and outputs can be between 4 and 64. DEXON can display 64 4K sources on 64 displays without limitation. With a solution of DEXON up to 4 windows / sources per display can be freely arranged and displayed. DEXON Systems Ltd. is a developer and manufacturer of advanced video wall controllers for multi-screen video display projects. Since its founding in 1990, DEXON Systems has grown to become a leading videowall technology and solution provider, working closely with system integrators and end-user partners worldwide. Today, DEXON systems have thousands of multi-image display walls and control rooms worldwide. For more than 30 years, COMM-TEC GmbH has been one of the largest and most renowned value-add distributors for AV media technology in Europe. The company headquarters is located in Uhingen near Stuttgart and distributes the products of more than 40 well-known manufacturers. At the same time it develops in-house products under its own COMM-TEC label. 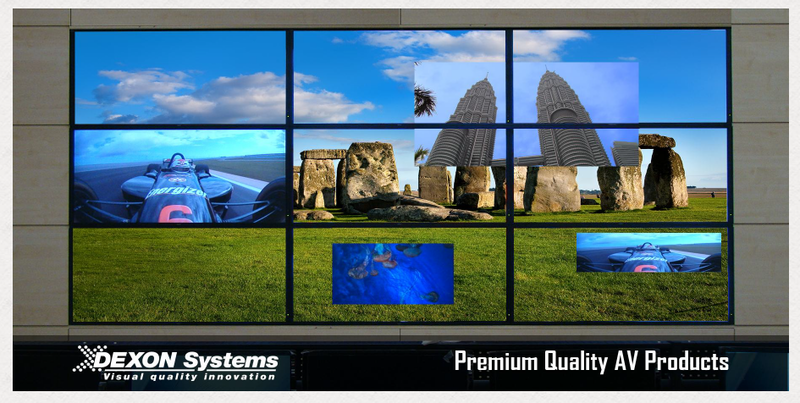 The business units ”Digital Signage + Media Solutions,“, ”Presentation,”, ”Signal Management + Conference + Control,” as well as ”Racks + Mounts" provide master technicians, system integrators and architects with the optimal hardware for their requirements. Of central importance here is the COMM-TEC slogan "Think Solutions": it creates a consciousness for thinking and acting in terms of solutions, and for offering solutions. COMM-TEC supplies everything from one source, from planning through consultation to implementation.